While I’m sure the move was made with more than the Yankees in mind, the Red Sox acquired a pitcher at the trade deadline who matches up very well with New York. That pitcher: Nathan Eovaldi. The former Yankee was good with the Rays (4.26 ERA and 4.28 FIP) and great with the BoSox (3.33 ERA and 2.88 FIP) this season despite a few of those classic Eovaldi blowups. A 31-point improvement in wOBA, not to mention those strikeout and walk gains, is pretty significant. Eovaldi’s always thrown exceptionally hard. 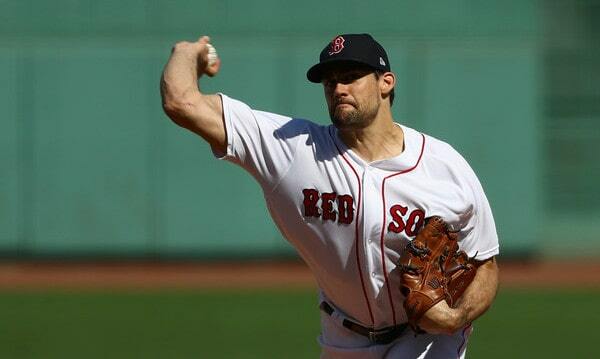 Even after his second Tommy John surgery, Eovaldi’s heater averaged 97.6 mph this season. His fastball was far more hittable than the velocity would lead you to believe though. The cutter gives him something to avoid the barrel. Four times Eovaldi faced the Yankees this season and the combined result was six runs (five earned) in 23.1 innings. The Yankees hit .173/.218/.272 against him. Yuck. It’s worth looking back at those four games real quick, so let’s do that now.
? Cash pushed Eovaldi a little too far in that game and it got out of hand late. Eovaldi held the Yankees to two runs on the Stanton homer through seven innings. Two runs in seven innings is a very good start. The three-run eighth inning makes it look like Eovaldi pitched worse than he actually did. 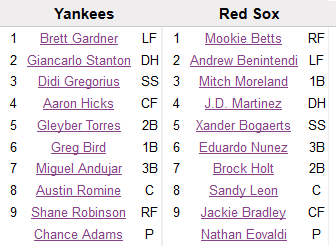 … but still, I’m not sure the A-lineup would’ve hit Eovaldi with the way he threw that afternoon. Another dominant start, though not to the extent of that August 4th outing. The Yankees had Aaron Judge, they had Andrew McCutchen, and they had Gary Sanchez. It was the A-lineup and Eovaldi still shut the Yankees down across six innings. Considering he’d only thrown 83 pitches in those six innings, I reckon Eovaldi could’ve gone out for the seventh inning as well, but at this point the Red Sox were auditioning middle relievers for the postseason roster, so someone else got the ball. A meaningless start. This was a tune-up appearance in the penultimate game of the regular season and Eovaldi was very much going through the motions. And he still struck out four of the eight batters he faced. Also, Eovaldi didn’t show the Yankees the goods. He threw his lowest percentage of cutters in months in this game. The Red Sox knew they could face the Yankees in the ALDS and they didn’t reveal any secrets. For all intents and purposes, Eovaldi made three actual starts against the Yankees this season, and he pitched very well in all three. That messy eighth inning on June 15th makes the box score line look a lot worse than how Eovaldi actually pitched. He was very good through seven innings. The August 4th and September 18th starts were dynamite. In three meaningful games against the Yankees this season, Eovaldi was as tough as it gets. Earlier this week Red Sox manager Alex Cora told Alex Speier the ALDS plan is to use Eovaldi in relief in Game One — or at least have him available in relief for Game One — and then start him in Game Four. That’s an old school baseball move, using your fourth starter in relief on his throw day in Game One. You don’t see that often these days. That’s the plan though. Eovaldi in relief in Game One and then the starter in Game Four. The Yankees could get dominated by Eovaldi and win the ALDS anyway. It’s possible. It just wouldn’t be easy. The Yankees have a very right-handed lineup and Eovaldi has been very good against righties this year thanks to his new cutter. No, the Yankees shouldn’t put Brett Gardner or Greg Bird in the lineup to get the platoon advantage. Stick with the righties because they’re your best hitters. It’s up to those righties to adjust and have more success against Eovaldi than they did pretty much all season.